My very first post on this blog was a beef stew. A very muddled and brown looking concoction that graces our table at least once a week. A curry that I can cook with my eyes closed and my brain off, a recipe that doesn't really follow exact measurements. One that is based on taste as opposed to numbers. Since then, I have published numerous recipes on this site. Many new, some old. Numerous experimental ones, some that were mistakes that turned out glorious. But definitely not enough heirloom recipes. You know those ones that you eat day in day out and don't even consider a recipe. Those meals that you learnt from your mom who learnt it from hers who learnt it from hers. The one that you teach your child just before they head out to university. The recipe that no one at home requests purely because it's such a staple. 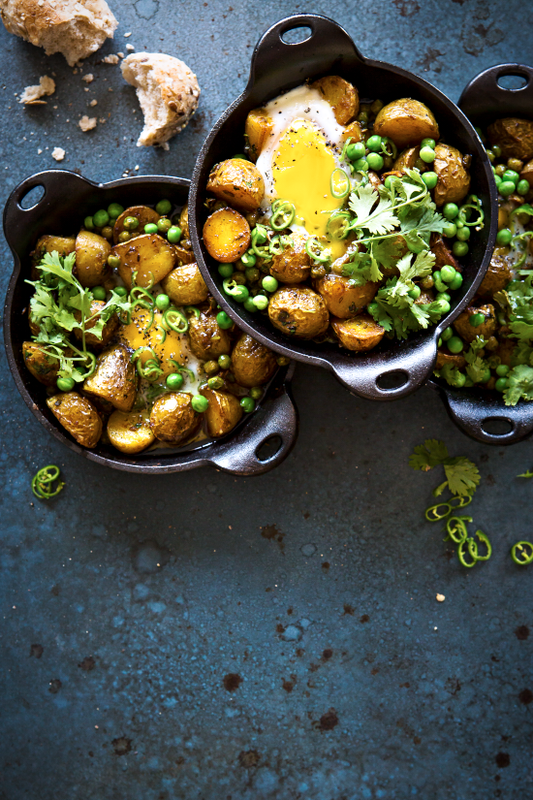 Today I'm sharing two such recipes. My mom makes this biryani recipe often. It's a Sunday tradition, an Eid tradition, a welcome back home tradition, a celebration tradition. A special occasion tradition that we like to have once a week even when there is nothing in particular to celebrate. Whilst the recipe is the same whether she cooks it with lamb or chicken, this smoke kofta version is my favourite. Smoked anything is a favourite of mine really. Then there is the roast chicken. Everyone's family has a roast chicken recipe. 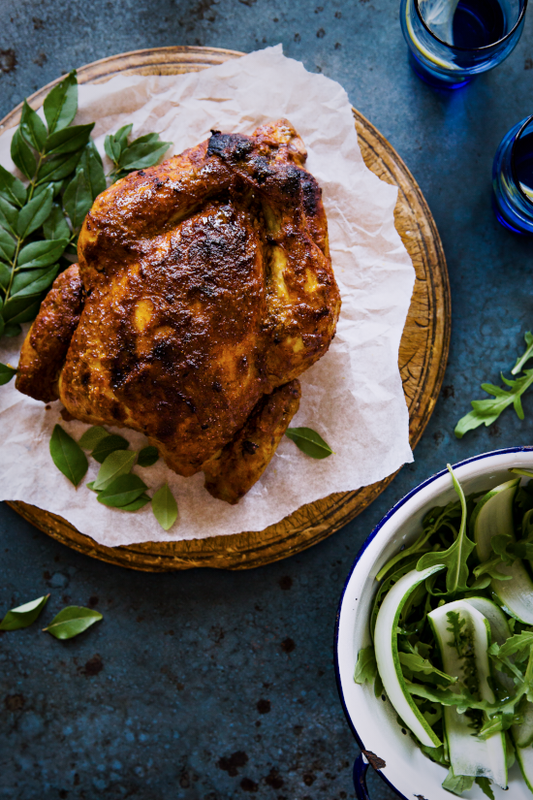 Everyone's mom makes the best roast chicken. Well, mine never did. We never really had a roast chicken for dinner. Ever. But that doesn't mean I can't start that tradition with my own little family. This recipe is definitely a keeper and one I hope will evolve into an heirloom recipe. It is requested often and I have a feeling it will be one of the first recipes I lovingly hand down to my own children when they head off to greener pastures. 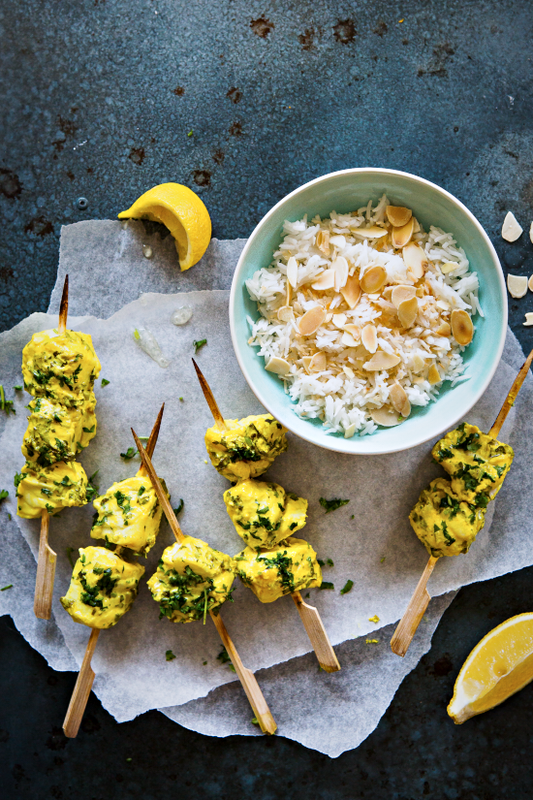 Other images are recipes for Pea, Potato and Egg Bake and Smoked Fish Skewers with Coconut Rice. Preheat the oven to 180 degrees Centigrade. Mix the first 12 ingredients in a bowl and coat the chicken thoroughly. Stuff the cavity with curry leaves and tie the legs with bakers twine. Place on a baking tray and roast for 30 mins. Add 250 ml water to they tray, mixing all the juices in the tray and baste the chicken. Roast for a further 90 minutes (or until thigh juices run clear when tested with a skewer), basting every half hour. You can add more water if there is no basting sauce left in the meanwhile. Remove the chicken and play on a clean tray, covering with foil, and leave to rest. Prepare the salad by shaving the cucumber with a peeler lengthways using a vegetable peeler. Place in a bowl of cold water and ice for 10 minutes to allow it to crisp up. Drain and toss it with the rucola and olive oil. Season with salt and pepper and serve immediately with the chicken. Heat oil in a large frying pan. Add the onion in batches and fry till golden brown, stirring with a slotted spoon every so often. As soon as the onion starts to turn golden, stir more often and keep an eye out as it can change color very fast. Drain on a paper towel and use two forks to separate the fried onion completely (this will help to keep it crispy). Repeat till all the onion is fried and set aside. Fry the potatoes in the same oil on medium heat until golden and cooked through. Drain on a paper towel. Bring a saucepan of water to the boil. In a bowl, mix together the mince, garlic, ginger, red chili powder, water and season well with salt. Make 1 inch meatballs and drop into the boiling water. Allow to boil for 5 minutes, then drain and set aside. Rinse the basmati in several changes of water and soak in a pan. Bring another saucepan of salted water to the boil and add 1 cardamom to it. Cook the rice until just done and drain. Crush the saffron threads in a pestle and mortar and add it to the milk in a small bowl. Heat in the microwave for 20 seconds and add to the drained rice (make sure the rice is completely dry, about 20 minutes). fluff roughly with a fork. In a heavy bottom saucepan, heat oil on medium heat and add all the dry spices. When the cardamoms fluff up, add the garlic, ginger and tomato paste. Add 3/4 of the fried onions (reserve the rest to garnish later), crushing them as you add to the pan and 200ml water. Fry on low to medium heat with the lid half covered, until the oil separates. When the oil has separated, add the yogurt and sugar and stir till incorporated. Add 300 ml of water and allow to simmer on low heat with the lid covered for 30 minutes. Add the potatoes and meatballs in the last 10 minutes, making sure not to stir too much so that the meatballs don't break. Preheat the oven to 170 degrees Centigrade. Layer the biryani in a heavy bottom saucepan suitable to use in the oven. 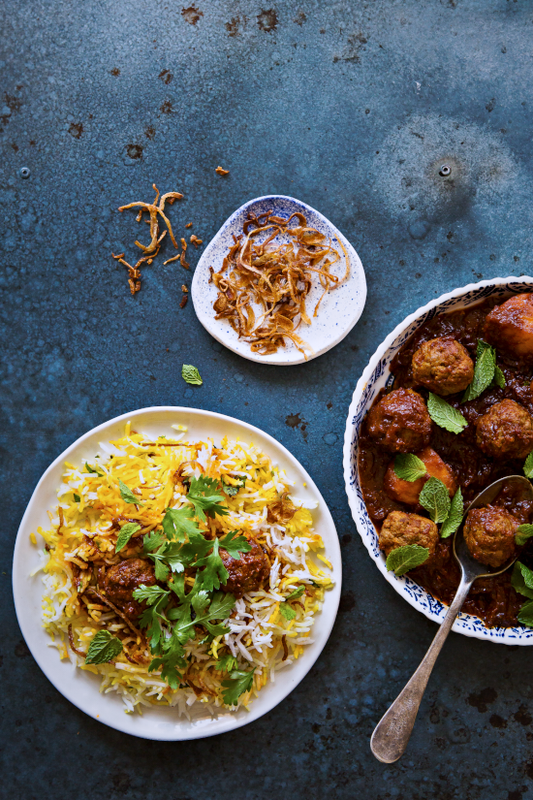 start with a thin layer of gravy and meatballs followed by the rice, fried onions, some mint and coriander. Repeat again making sure the top layer is rice topped with onion only. Cover with a lid or foil and heat in the oven for 20- 30 minutes. Serve immediately. Magnificent flavors! This dish is fabulous. Hard to resist to this flavoursome biryani and that succulent roasted chicken. Both the recipes are just so good... bookmarked! I wish I could download the dish and eat it right away. OH YUM!! I need these smoked kofta biryani in my life! That kofta biryani is calling my name Sukaina, smoked and all. Thank you for the beautiful share! Oh my god I want this now! Love your blog and your photos are just beautiful! i absolutely loved what you did to spices..so beautiful. I never ate roast while growing up either but i love making it for Sunday dinner..i will try your recipe soon, looks delicious. This looks yummy even though I eat mostly veg. 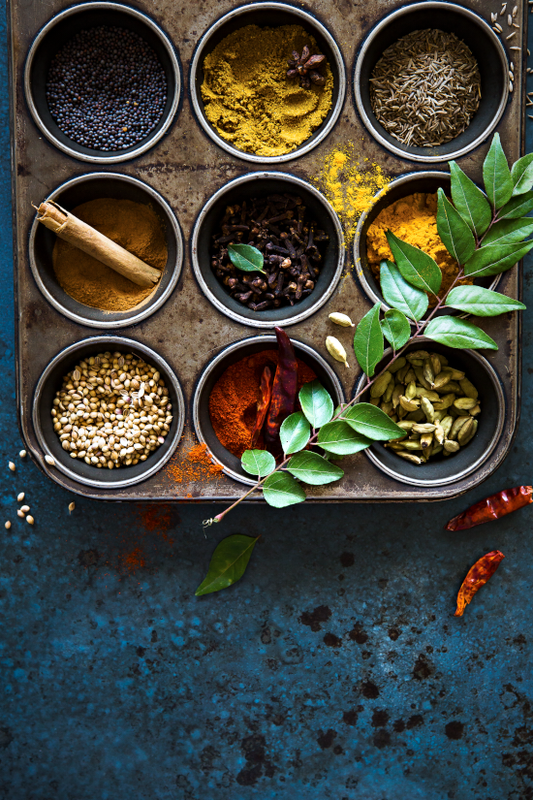 I love the idea of putting the spices in the muffin tin -- your photography and styling have gotten really good, dear! I love your dark blue grey backgrounds. What is it? Stone? Art paper? Stunning! I will be making this for sure! This is Really nice Tips. Thanks to sharing wonderful Tips. Gorgeous spread. Love the spices shot. Thanks for sharing this wonderful post, It is awesome. Your photos are just beautiful, and this food looks so delicious. stunning photos! what camera do you use? The photo of the spices is absolutely stunning!! What do you use to cover them? It looks like it's a muffin tin you're using on the bottom? I picked up some delicious veggies and chicken at the farmers market this weekend and can't wait to use them to try this recipe! It looks delicious. Check out my farmers market experience at www.cayisa.wordpress.com! Those eggy potato bakes. Divine. I'd have those anytime of the day!! Nice good job! i love it. I also want to share my Philippines Food Recipes blog. http://philippinesfoodrecipes.wordpress.com This blog helps you to cook and prepare best Filipino Foods in easy way with no hassle. If you have any suggestion or question about the Filipino food recipe just let me know. I'm glad to help you. Follow me. Thank you. Looks heavenly! I am going to try it this weekend. I Love your blog, especially your photography! Beautiful. Greetings from Texas! Wow that looks lovely, great summer recipe. Thanks for sharing this, gonna give it a go one night. This looks fabulous and as always, your photos are just outstanding! Everyone has good comments to share without actually making the food. I think the most beneficial comments are those that are made after you try the recipe! I made the chicken roast and I have to say it was absolutely amazing! The technique and flavors were remarkable and this recipe is such a keeper. I think anyone who makes it will have their guests in awe of how great of a cook they are! Thank you for sharing this great recipe! The food looks awesome and am sure, the taste must be heavenly as well. Penelitian ini bertujuan jasa seo untuk menganalisis pengaruh etos kerja dan komitmen wisata pulau tidung karyawan terhadap kinerja organisasi di grosir tas Rumah Sakit Umum PKU cream walet Muhammadiyah Nanggulan. Berdasarkan hasil kaos distro penelitian terdahulu, etos kerja dan komitmen wisata banyuwangi berpengaruh signifikan terhadap kinerja. Oleh sebab itu jasa desain logo organisasi perusahaan wisata merapi baiknya meningkatkan dan mempertahankan etos kerja dan wisata kuliner nusantara komitmen agar menghasilkan kinerja zahira baby shop yang baik pada karyawan. Metode jual genset Penelitian dilakukan di RSU PKU Muhammadiyah Nanggulan. Metode yang digunakan jual action camera berupa wawancara dan kuesioner peninggi badan skala Likert pada 63 orang. Asyikkk, bentar lagi liburan. Enaknya liburan ke bali aja. Harganya murah kok, anda bisa menggunakan paket wisata bali yang kami tawarkan. Bagi anda yang ingin berkeliling mengunjungi banyak tempat wisata menarik di bali, anda bisa menggunakan paket tour bali yang ditawarkan. Yuk, kunjungi website kami . . . The information and the aspect were just wonderful. I think that your viewpoint is deep. It’s just well thought out who knows how to put these thoughts so well. thank u for sharing such a useful information... if u want to promote your business than plzz have a look.. Very nice. grilled chicken is my favorite dish. Thank you for sharing the information.! Happy 4th of July 2016 SayingsHappy 4th of July Sayings for all thanks. I love Indian dishes. Thanks for sharing. I also love Wow Garcinia Cambogia weight loss pills. Great website! It looks really professional! Sustain the great job! Online gaming is a hobby of many people. Game Run Unblockedversions as Run 3 Unblocked or Run 4 Unblocked is a very interesting game to control the bear run or jump to the safe landing area falls. risks with such racing game Car Racing Games or interesting as the game Donkey Kong Unblocked or Car Racing Games wrap pulled a lot of players. Good luck! great work.. waiting for new posts..
Hi do check out these awesome images and results which you are looking forward too. Great pictures. I like them. Great post. Thanks for the contest. Perkenalkan kami Citra Mebel Jepara sebagai perusahaan yang memproduksi mebel jepara ingin menawarkan produk-produk unggulan khas jepara jawa tengah indonesia yang cantik dan indah dengan harga yang tentunya relatif lebih terjangkau. Produk furniture jepara berkualitas menggunakan bahan baku kayu jati, kayu mahoni, trembesi dan jenis kayu lainnya yang tentunya dapat menyesuiakan keinginan anda. Ada berbagai macam produk yang kami buat. Diantaranya adalah produk Set Kamar Tidur. Komposisi set kamar tidur diantaranya adalah tempat tidur, lemari pakaian, meja rias, dan nakas. Adapaun set kamar tidur yang kami produksi antara lain Set Kamar Tidur Minimalis, Set Kamar Tidur Mewah, set kamar tidur ukiran dan set kamar tidur modern model terbaru saat ini. Harga yang kami tawarkan untuk set kamar tidur ini sangatlah beragam, hal ini didasarkan pada bahan baku yang digunakan, tingkat kesulitan pembuatan produk, ukuran dan warna finishing yang ingin anda aplikasikan pada produk mebel furniture jepara yang anda pesan. Anda tidak perlu khawatir mengenai harga, karena harga yang kami tawarkan dapat menyesuaikan dengan keuangan anda. Produk set kamar tidur ini, kami produksi sendiri secara langsung di Jepara, dikerjakan oleh pengrajin professional dalam bidang furniture jepara yang telah berpengalaman, sehingga produk yang dihasilkan adalah produk dengan kualitas terbaik furniture jepara. Jika anda berkenan untuk memesan produk furniture sesuai dengan keinginan anda, kami siap melayani dan membuatkannya untuk anda. Langsung saja hubungi kami untuk mendapatkan penawaran produk furniture jepara berkualitas baik furniture indoor ataupun furniture outdoor. Terimakasi, salam hangat dari kami dan selamat berbelanja furniture terlengkap dan terpercaya hanya di Citra Mebel Jepara. iOS 10 is the tenth major release of the iOS operating system developed by Apple Inc., being the successor to iOS 9.iOS 10 improves and adds upon user experience system-wide including 3D Touch expansion, an updated lock screen, and "widget" support. There are also added features to apps: Messages adds expressive ways to communicate, Maps has been redesigned and extended with third-party functions,Home manages HomeKit-enabled accessories within one place, Photos helps users access algorithmic Memories, and Siri is now compatible with third-party app-specific requests, such as starting workouts, sending IMs, requesting Lyft or Uber and making payments. To download Latest IOS version "IOS 10" and its Jailbreak free from CydiaNerd.